“I sold everything I owned. My bills are less than $1000 per month. My costs are low enough that there’s no burden to my lifestyle. I don’t feel like I’m missing anything. It’s been a lot of fun in this time of life,” said Michael Fuehrer, owner of the brand Navigation Nowhere. Fuehrer (pictured) describes himself first as a traveler. He has, more than once, found solace on the open road when the pressures of life “overwhelmed my mind and I chose to travel to re-energize myself and find clarity.” He has been traveling nonstop in his 35-foot, 2004 Thomas Freightliner skoolie ever since he bought it on Craigslist, gutted it and built it into his dream home on wheels. Fuehrer plans to be in Florida and Louisiana in December and then, in January, “I’ll be starting a new build for myself that I hope to have completed by spring.” He plans to keep the current bus for his parents’ retirement or to rent out. “I have some ideas for my new bus, but I haven’t made any final decisions yet,” disclosed Fuehrer. “My bus was designed in keeping with a craftsman style home in the Pacific Northwest, and the green tones and cedar fit in with that style,” explained Fuehrer. In a past life, Fuehrer’s rig was a 72-passenger school bus. It has a Mercedes 900 engine, automatic transmission and gets 10 MPG. Converting it into a well-appointed RV home required various skills. “Insurance companies don’t love us just yet. 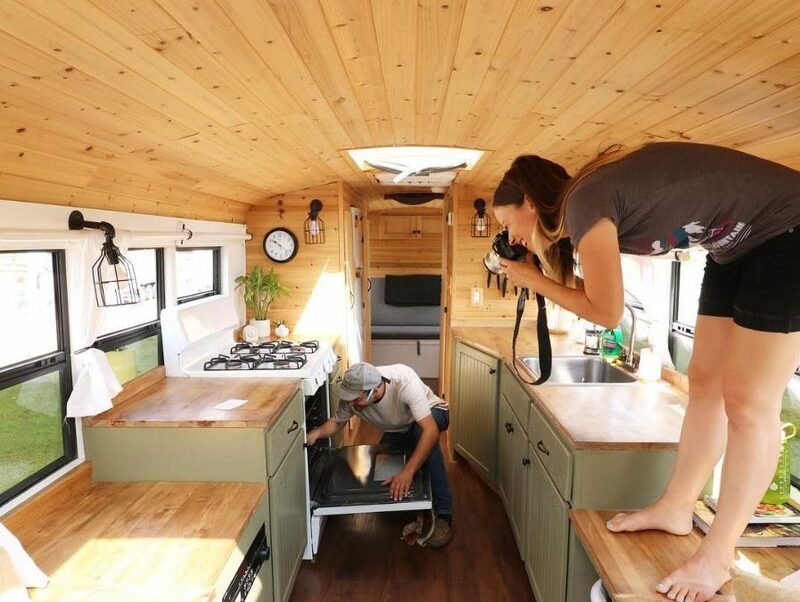 Part of the reason is builds run the gamut from 1970s hippie wagons wired with lamp cord to professionally built, high-quality rigs,” said Fuehrer. “The more I learn and explore new people, places, and projects, the more I find a freedom in navigating my life. I’m seeing that being nowhere allows me to be more present, or now here, for the people and projects I engage with, and that is worthwhile to me,” said Fuehrer. You can meet Michael Fuehrer and tour his skoolie at the Mid-Atlantic Tiny House Expo — Maryland on October 6-7, 2018. 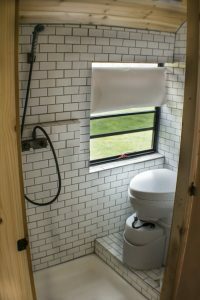 For more information and tickets, go to TinyHouseExpos.com.